None of our founders play Urban Dead any longer, but their efforts in forming our group and the ideals they set in place remain as a testament to their commitment to fair play and their ability to bring people together to achieve more than could be imagined. 10 minutes from hell would not be what we are today without the efforts of our founders and there is no way I can thank them enough! 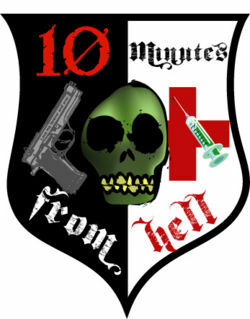 The 10 minutes from hell crest we use in our banner was created by Wugmanmax and I'd like to thank him for allowing our continued use of this graphic. All current Urban Dead-based discussions will be held here, in our new home, but the old forum with non-gaming discussion is still in place. If you have an interest in comic books, movies, and general (sometimes goofy) discussion feel free to visit The Board to converse with like-minded individuals! Wug and Kyle still post in the general discussion area at the old location. They tell me that anyone is welcome to stop by any time! Check it out! Thank you, again - to our Founding Three! You may be gone from the game, but you are still very much remembered and appreciated! PastorJeff was the last of the three to stop playing UD. We held a memorial service for him and many of us - and our alts - sent flares up in his honor. So long, PastorJeff! You are missed but we will never forget you!